Our trip to Death Valley was precipitated by a tip from our friend Dennis about the super bloom just getting under way. He was planning to head down for it and wanted to know when we might be there. We coordinated schedules and he met us here on our fourth day at the park. Dennis loves driving so while he was here here I moved over to the shotgun position and Trail took up the back seat in his Audi Quattro SUV. After a day showing off some of what we’d already seen we decided on doing some driving adventures through the park. There are quite a few rough and ready drives with incredible scenery to choose from. Where are all the mules? 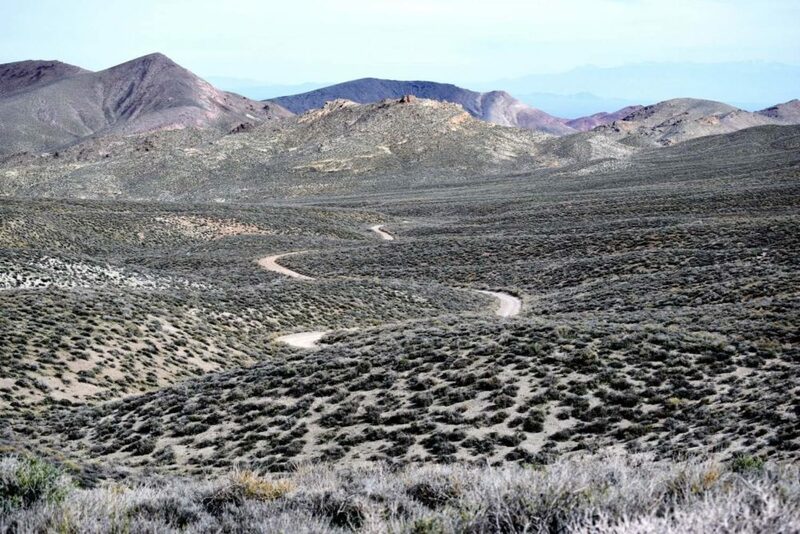 First up was a short trip through what is called Twenty Mule Team Canyon. It’s only about 2.7 miles long and takes very little time to traverse but it is a striking drive. It winds through badlands that were once a lake bed. The terrain is devoid of obvious life and consists largely of dune like hills made of light tan mud and sandstone. The road is little more than a flat dirt track winding among these stark but beautiful hills. Dry as a bone when we went through, I suspect on the very rare occasion of heavy rain it turns into a mud pit of epic proportions. Starting to get twisty, still no mules. Like the salt flats, the Twenty Mule Team Canyon’s beauty is in its starkness and near monochromatic appearance. While driving it we happened across a photo shoot of a tall woman in a flowing black sheer garment posing against the terrain. Professional shoots are not uncommon in the park and we’ve seen a few in the short time we have been here. This is a one way track and you definitely don’t want to take your trailer, sports car or over sized vehicle down here. It is windy and sometimes steep but not especially rough or hazardous so most cars could safely make the journey. 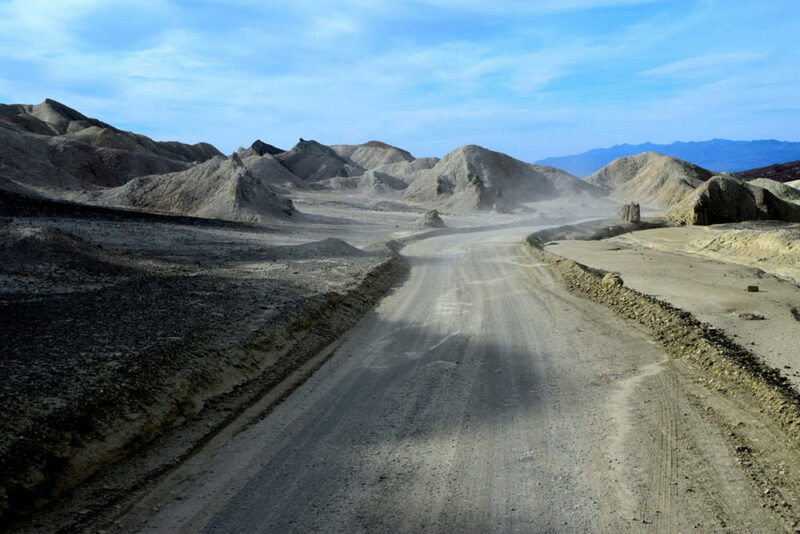 If you want just a wee bit of driving adventure or have some 15 minutes to kill in Death Valley, I strongly recommend it. Forget the mules, this place is awesome! Titus Canyon is more of a commitment but if you are looking for some more substantial adventure I can’t recommend it strongly enough. 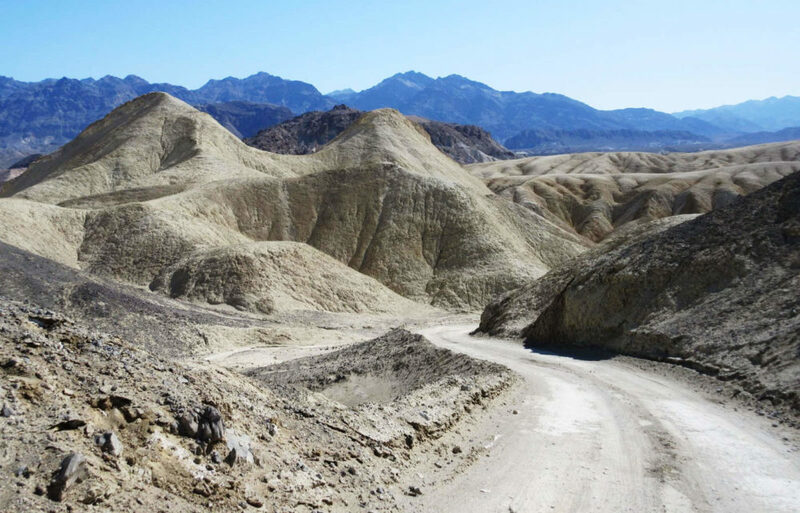 The road through Titus Canyon starts outside of the park and when you are done you end up in Death Valley itself. 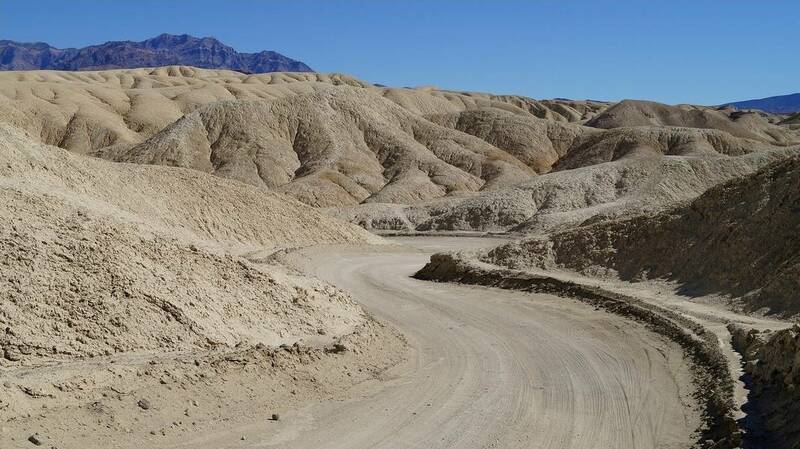 It is a one way rocky dirt road some 27 miles long through remote territory. It is prone to wash outs, rock slides, flash floods, snow, and other perils so check the weather before you go and be prepared for a rough ride that will take at least 2 hours. On our trip we passed a driver who’d gotten a flat in the first mile of the journey so we took it slowly and deliberately. The first few miles are through unremarkable flat lands. The road then winds gently up into a series of hills where the desert, at least in the spring, was surprisingly green and lush. After a time the road starts to climb a series of winding switchbacks through spectacular rocky mountains. Then it winds down again along the edge of some steep rocky cliffs. It the precarious road doesn’t take your breath away the scenery will. The rocky hills and cliffs just keep getting better the further you go. After many wonders, as the descent gets more gradual you come to the grand finale. 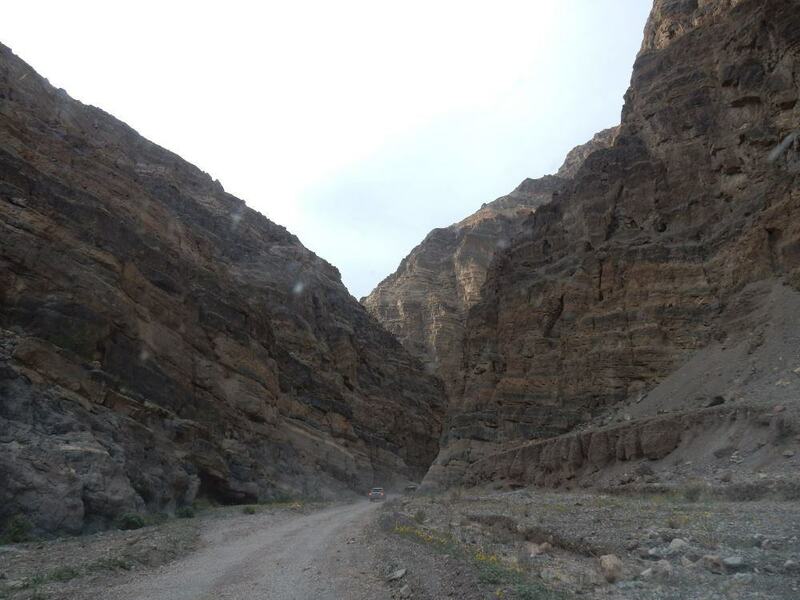 The road heads right through the mountains among sheer cliffs, overhangs, and canyon walls that press right up on both sides of the narrow road. At this point it is hard for photographs to do justice to the awesomeness of driving through these grand gates of stone. Nearing the end of the Titus Canyon road. Along the way there is plenty to stop and look at. 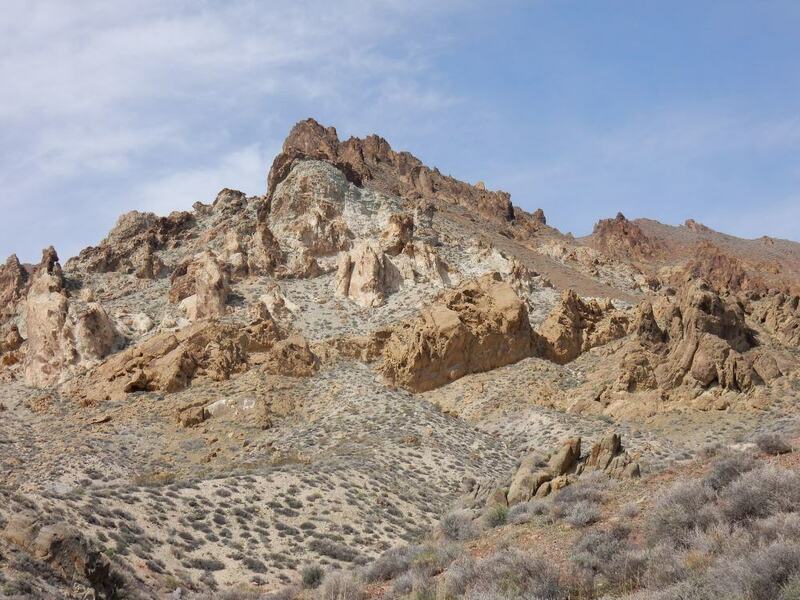 There are numerous turn offs offering trails to scenic vistas where you can look for big horned sheep and other wildlife. Half way along the descent you can stop at the site of an old mining town where you can walk in and among the remaining buildings and scattered corrugated tin. 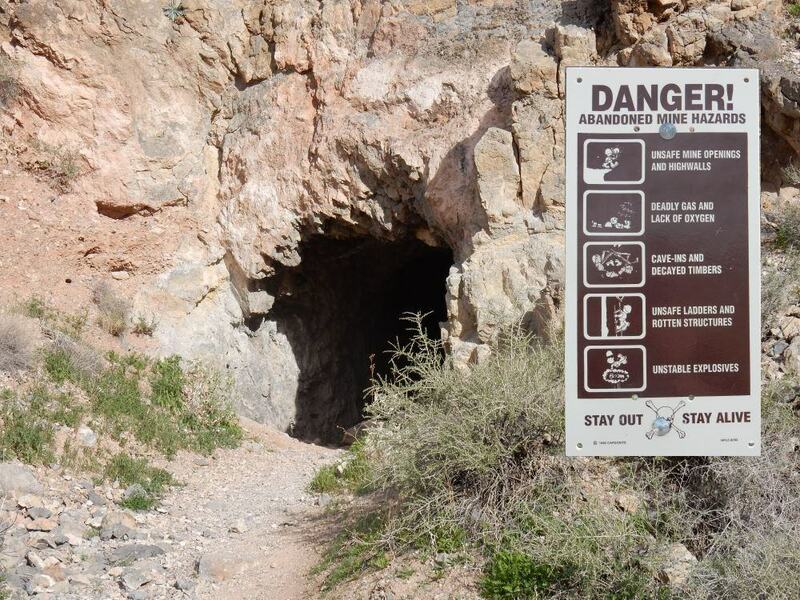 Here and at many other locations in the valley you can find old mines. Most have been secured against trespass for the safety of explorers but you can peer into the gloom and imagine the dangers in the dark. Handy signs can help with this imagining. Perhaps a bit too exciting for further exploration. At the end of the road, through the canyon, is a parking area where folks can hike up along the road or explore another nearby canyon on foot. Even if you are not up for the drive you can take a short walk and experience some of the most awesome terrain. While you have to walk along the road, the cars have to go pretty slowly so the only real worry is dealing with the dust they kick up. However you choose to check it out, Titus Canyon is well worth your time and makes for a memorable and inspiring adventure. 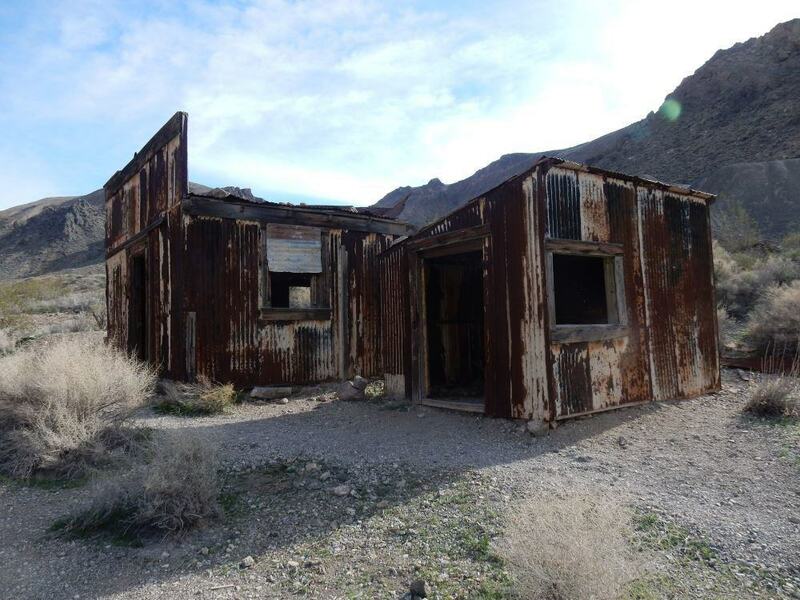 The abandoned mining village on Titus Canyon Road.